We have a seven-member board: Executive Directors Tim Fox and Amy Robertson, and Senior Counsel Bill Lee are all on the board; read more about them and view their bios on the “Who We Are” page. Alan is a lifetime advocate for civil rights. His research includes federal remedies for civil rights violations, free speech doctrine and theory, and lawyering for social change. He is a past chair of the Association of American Law Schools Section on Civil Rights. In recent years, he has litigated several high-profile, pro bono civil rights cases in the federal courts, including two suits challenging so-called Ag Gag laws that criminalize efforts of activists and journalists to expose misconduct on factory farms, an excessive force case against law enforcement officers who used pepper spray to subdue peaceful environmental protesters, and a successful facial challenge to a Colorado law mandating that all students and teachers recite the Pledge of Allegiance in public schools. Since joining the University of Denver Sturm College of Law faculty in 1992, Alan has received awards for teaching, contributions to the law review and pro bono legal work. Before entering teaching, Alan was a civil liberties litigator with the ACLU’s Chicago office, focusing primarily on cases concerning the First Amendment, police misconduct, and privacy rights. Before that, he served as a law clerk to the Honorable Marvin E. Aspen, U.S. District Court judge for the Northern District of Illinois. Alan received his J.D. from Stanford University in 1985. Currently, Tom is Counsel at Killmer, Lane & Newman, LLP, where he focuses primarily on representing individuals for social justice advocacy and pro bono work. He was previously Senior Counsel at Ballard Spahr, LLP. Tom also serves as Fellow Emeritus for Litigation Counsel of America, and has held numerous esteemed positions in the past, including Governing Board Member for the Colorado Bar Association, President of Media Law Resource Center’s Defense Counsel Section, and President and Board of Directors member of the Colorado Freedom of Information Coalition. Tom has received numerous recognitions for his work, including being named Law Week Colorado Lawyer of the Year in 2013, and receiving First Amendment Lawyer of the Year designations in 2011, 2012, and 2015 by The Best Lawyers in America. In 2018, he received a First Amendment Leadership Award from Media Law Resource Center in recognition of his career-long accomplishment of protecting the rights of news operations. He has been ranked in the top tier nationally by Chambers USA in First Amendment Litigation for over a decade. Tom holds a B.A. from Amherst College and a J.D. from the University of Denver Sturm College of Law. Mark is a Director of the Healthcare and Pharmaceuticals practice area of The Livingston Group LLC. Mark served on President Obama’s Transition Team and in President Clinton’s White House as Assistant to the President for the Office of Management and Administration. His areas of responsibility included the White House Military Office, which managed Air Force One, the White House Communications Agency, the Medical Unit, and Camp David; running the White House Operations; and the Executive Office of the President’s Office of Administration, which was responsible for finance, information systems, human resources, legal/appropriations and security. Mark’s office was responsible for the logistics of all domestic and international Presidential travel and special air missions. President Bill Clinton selected Mark to be the operational lead for the White House’s 2001 transition preparation and execution. Prior to his appointment to the White House, Mark served as senior legislative aid and counsel to Congressman Louis Stokes (D-OH). 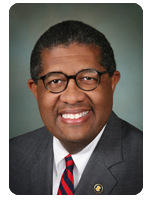 He worked closely with Democrats and the Congressional Black Caucus on a number of business and economic issues. Mark was a member of Senator Hillary Clinton’s Minnesota Finance Committee for her 2008 Presidential campaign. Before joining The Livingston Group, Mark was with UnitedHealth Group, one of the world’s largest healthcare companies, where he held a number of senior positions including President of the AARP Pharmacy Services Division and Vice President of Public Communications and Strategy. Mark holds a B.A. from Macalester College in St. Paul, Minnesota; a J.D. from Case Western Reserve University School of Law; an M.A. in International Affairs from Georgetown University; and a graduate degree from the Advanced Management program at the University of Pennsylvania’s Wharton Business School. He is a member of the District of Columbia Bar. Mari Newman is a Partner at KILLMER, LANE & NEWMAN, LLP, where her practice emphasizes Civil Rights and Employment Law. Mari has dedicated her entire career to advocating on behalf of the underdog and disenfranchised against the entrenched power of government and corporations. Mari has consistently been voted among the Top 100 Lawyers in Colorado and Top 50 Women Lawyers in Colorado. She has repeatedly been designated as a Colorado Super Lawyer. Mari has been recognized as the Lawyer of the Year in Denver for Employment Law – Individuals for both 2017 and 2014 by The Best Lawyers in America®. Mari is a 2016 recipient of the Colorado Women’s Bar Association Foundation’s “Raising the Bar” award honoring women lawyers who have made a difference and raised the bar for other women. In 2015, Mari received the Martin Luther King, Jr. Business Award, celebrating “Content of Character,” the GLBT Bar Association Foundation’s Attorney of the Year award, and the Shorter Community AME Shoes of Justice Award honoring those who have “walked the walk of justice.” In 2014, Mari was named as a Lawyer of the Year by Law Week Colorado, and as a Top Lawyer in the areas of Civil Rights and Labor and Employment Law by 5280 Publishing. She was twice voted Law Week Colorado’s “Barrister’s Best” Plaintiff’s Employment Lawyer, and was recognized as one of 7 Top Women Attorneys in 2013 by Law Week Colorado. Ms. Newman was honored with the Denver Gay & Lesbian Chamber of Commerce’s 2012 Entrepreneurial Woman of the year.